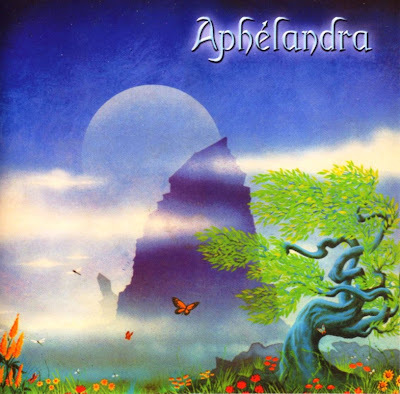 Aphélandra is a French symphonic prog band who recorded one album in 1976 but never saw its release, due to the ridiculously low offer from their record company at the time. For the next 25 years, the tapes have gathered dust in the keyboard player's attic until Mellow Records decided to release it in cd format in 2001. The stellar line-up included Philippe Grancher (keyboards), Pierre Videcoq (vocals, flute, tenor sax), Gerard Perret (electric guitar), Philippe Herbin (bass), Dominique Iroz (drums, percussion) and Clement Duventru (drums). Famous violinist Didier Lockwood as well as Cyrille Verdeaux (on piano and synth) also appeared as guest musicians. Except for those two, all members of Aphélandra have long since left the music industry, each going their separate way. Their self-titled album ("Aphélandra" is the name of a flower) is made up of classic French 70's prog with an interesting mix of classical sections, composed ensemble work and free-wheeling improvisation. The mainly symphonic nature of the music is interrupted now and then by solitary piano that gives their sound a distinct feel. The long instrumental passages are a welcome change from the melodramatic vocals often characteristic of early French prog bands. Not a masterpiece by any means but still worth a listen, if only for the 18-minute epic opening track. For collectors of rare 70's symphonic prog.